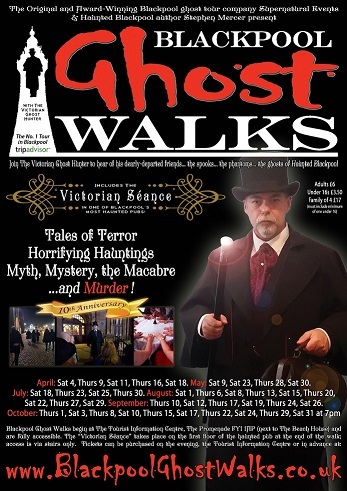 The No 1 Tour in Blackpool is back with NEW locations, NEW tales (and some old favourites) and "Victorian Séance" in a haunted pub! Fridays 24 & 31 May: The Ghost Tram All Aboard if you dare on this gripping and chilling Blackpool to Fleetwood return heritage tram tour. 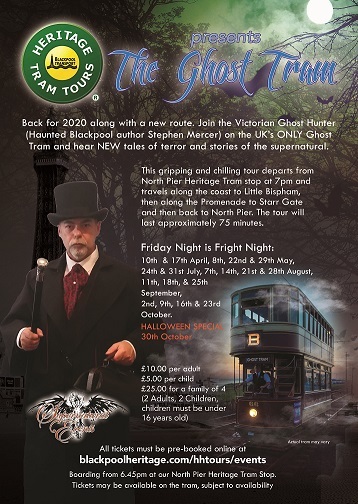 Fridays 26 July to 18 Oct: The Ghost Tram All Aboard if you dare on this gripping and chilling Blackpool to Fleetwood return heritage tram tour. Please note, should anyone arrive at any event and they are suspected of being under the influence of alcohol or drugs, they will asked to leave immediately. No refund will be given. 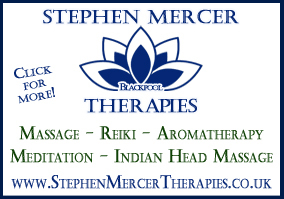 Further details on our terms and conditions pages. Thank you.